Sparkling wine is an incredible and splendid kind of drink. Not only is it delicious, and versatile for food pairings, it transcends being a wine to become an icon of culture. Its mere mention evokes images of everything from proper celebrations to a heady life on Easy Street. All that said, it’s also serious and big business. The Champagne region has long defended its reputation as the first and finest expression of sparkling wine. Its Comité Interprofessionnel du vin de Champagne spends millions in legal battles to ensure the name Champagne is never used improperly, whether for a wine or any other product. Even the term “Champagne Method,” which describes the technique originally developed in Champagne, was outlawed in Europe 20 years ago (it’s been replaced by “Traditional Method”). But, thankfully, the prestige and joy of Champagne has inspired many producers to follow in its footsteps. 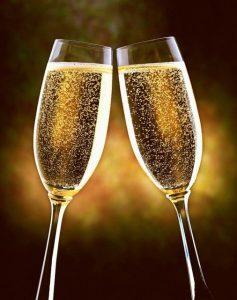 While some of the resulting wines come from Europe (Franciacorta from Italy’s Lombardy region, Spanish Cava and Crémant from France’s Loire), there are now many examples of distinctive and brilliant sparkling wines from the New World, made with the same meticulous techniques originally developed in Champagne. Starting things off is one of Canada’s best sparkling wines, the Gold Label Brut from British Columbia’s Blue Mountain Vineyards. Built on acreage acquired in 1971 by founder Ian Mavety, the winery first grew grapes for other wineries before starting to produce its own wines in the early 1990s. Over two decades, its focus has been to produce estate-only wines using sustainable practices that showcase the climate and conditions of the Okanagan Valley. So confident are they in their identity, they’ve eschewed, and even criticized, the VQA system to which the majority of Canadian wineries belong. Today, two generations of Mavetys make sure the winery’s viticulture and winemaking practices are carried on, and the non-vintage traditional method Gold Label Brut is the result. This wine, made from mostly Pinot Noir and Chardonnay grapes with a small amount of Pinot Gris, is consistently impressive. Its bright fresh character is highlighted with generous notes of tree fruit, citrus and stoney minerality. Two years of bottle aging “sur-lie” — a process whereby finished wine is allowed to sit in its lees, the sediment that settles to the bottom of the carboy, in order to extract flavours — has provided a yeasty and toasty element. It’s sold at Vintages for $28.95. For a New World sparkling wine from a little further afield, the Jansz Premium Cuvée fits the bill. Established in the late 1990s by the Hill Smith family, owners of Yalumba Family Vigneron, Jansz makes excellent examples of the quality sparkling wines made possible in the cool climate of Tasmania, an isolated island state off Australia’s south coast. Composed of Chardonnay and Pinot Noir, this tasty wine shows rich flavours of lemon and stone fruit, nut, fresh acidity and a creamy texture. Find it at Vintages for $26.95. My final New World sparkling recommendation has a distinctive pedigree. Schramsberg Vineyards began with the purchase in 1862 of a large piece of mountainside land in California’s Napa Valley by German immigrant Jacob Schram. After Schram built the winery into a success, it went through a variety of owners until it was purchased by Jack and Jamie Davies in 1965. Since then, the Davies family has made Schramsberg one of the flagships of premium American sparkling wine. Every U.S. president has served Schramsberg sparkling wine at state functions since Richard Nixon toasted China’s premier Zhou Enlai in 1972. Its 2012 Rosé Brut, available in six-bottle cases from The Vine Agency for $65.95 per bottle, is complex and delicious. Composed of three quarters Pinot Noir and one quarter Chardonnay, this wine shows tremendous character and will wow sparkling wine fans. Pieter Van den Weghe is general manager and director of wine at Beckta. Pieter Van den Weghe is general manager and wine director at Beckta dining & wine.